All transactions are safe and secure with a reliable history in online purchasing behind each of our associates. 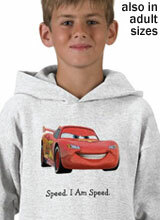 Buy the Lightning McQueen Hoodie Sweatshirt to own Cars clothing and merchandise. Customize this Disney Cars sweatshirt with your favorite Lightning McQueen catchphrase from the Pixar movie. We've added one of his most popular, but you can customize it with your favorite quote or you can add whatever text you prefer, such as your son's name or the character's name. This Lightning McQueen sweatshirt will keep you warm on cool days riding your bike through Radiator Springs. The design is also available on a Disney Cars t-shirt or on a hoodie like the one shown on the left. Choose the style and color that gets your wheels turning. In addition to the Lightning McQueen Hoodie Sweatshirt above, browse the Cars Clothing Gallery for more apparel like men's and women's clothes, kids shirts or hoodies.